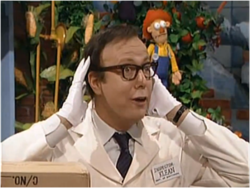 Inspector Klean is a sanitation inspector who works for the Board of Sanitation, appearing in The Super Mario Bros. Super Show. He was played by Gary Schwartz. In the live-action segment "Toupee", Mario and Luigi are cleaning Mario Brothers Plumbing for Inspector Klean's visit. The inspector eventually examines their house, and warns they surely will be evicted. During the inspection, Ratigator steals his toupee while he's taking some notes, distracted. When almost concluding the visit, and still not aware his hair is gone, Clog jumps onto the inspector's head, making him angry. When the creature jumps of Inspector Klean, it's revealed that his hair had grown back, much to his pleasure, because according to him he hadn't hair since he was five years old. As result, he decides to not evict Mario and Luigi and tells them they passed the inspection. This page was last edited on February 7, 2019, at 01:25.